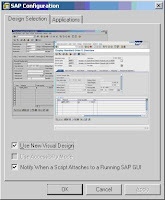 Imagine you need to make a small demo of some BI functionality not depended of data type. All yo need is to have some data which can be used in your model. Where to get some data? For such a purpose it is convenient to use Data Model of SAP demo application SFLIGHT/flight data model or sometimes better know as BC_TRAVEL model. Data of this model are often used in SAP standard training courses of ABAP, Basis areas (e.g. courses of Internet Transaction Server, SAP Web/Application Server). Data model is delivered with Basis component in development package called SAPBC_DATAMODEL. In case you want to use it you need to run transaction BC_DATA_GEN and fill up its selection screen according your needs. Find more information about Flight Model on help.sap.com. I have found few interesting SAP notes where a phrase “Dr. ABAP” is appearing in sections like “Additional key words” like in note 212462 or it is mentioned in comments on ABAP code correction attached to notes. I was wondering what this mysterious term of Dr. ABAP could imagine. Based on research I did on internet it seems that this was a kind of nickname of Mr. Axel Kurka former SAP guy who greatly contributed to development of ABAP engine, NetWeaver Application Server and lot of others SAP’s technologies. Axel is considered as one of ABAP fathers. His nickname was present in his articles published in “SAP Technical Journal” magazine (currently being published under name SAP Professional Journal). Acknowledges of Axel’s work has been published in several SAP resources, e.g. by Mr. Andreas Blumenthal and Horst Keller in their article; on site Alte-SAP.de. Let me join them. Thank you Axel, RIP. I have done reading of Gary Nolan’s book: Efficient SAP NetWeaver BI Implementation and Project Management. First of all this is my first non technical BI book. As I’m used to read mostly technology books, SAP notes, technical white papers, SDN forums, etc. That’s why this book was quite unique. Not so many technical issue discussed in detail - just to notification of them and few tips how to solved them and even avoid them. As first BI project is introduced in all of its flavors and regardless of BI product release. It is clearly stated here what BW is and what is not, what to expect out of it, what makes project successful etc. Basically a term of “what it takes a BI project” and all kinds of BI projects are discussed here from all of its phases (project planning -> gathering and analyzing requirements -> development/build/testing -> preparing GoLive -> after GoLive). Author is utilizing his broad experience and describing all potential issues within project. From this point of view book is very useful. Other helpful staff in book is examples of BI project deliverables like: standards documents, project plans, naming conventions, check lists, test scripts, etc. For more details see book homepage at SAP Press or at Galileo Press. Having troubles while browsing service market place (also known as OSS)? Same with me; I usually start with http://service.sap.com; I log in via S-User ID and this redirects me to one of application servers which have hostnames like websmpXXX.sap-ag.de. Then sometimes some links are not working from this server – as server seems to be broken. This seems to be often caused by overloaded particular server websmpXXX. Server farm of OSS is suppose to be working with load balancing concept but this problem on some conditions still persists. Therefore it can be very quickly solved by switching to other server directly in URL path in your browser. E.g. introduction page of OSS can be switched from websmp209 to websmp203. A winner of 2008 series of Formula 1 championship is known! It is Vodafone McLaren Mercedes driver Lewis Hamilton. As SAP is a technology partner of the team it is SAP success as well. Company is joining congratulation to Lewis on their official pages. He won series of 2008 championship on 2nd of November 2008 at Interlagos Circuit, Sao Paulo, Brazil. Actually he did not win this match but he scored the best in overall tournament results. SAP is a long term sponsor of F1; currently supporting Vodafone McLaren Mercedes Formula One Racing Team. SAP is software provider for the team. You can learn more about their partnership at McLaren pages here and SAP’s pages here. To enable it you need to maintain table RSADMINSV via e.g. TA SM30 and check out “Drag&Drop off” field. Usually end users are using SAP Portals (Enterprise Portal) or any other portal for accessing BI queries. You as a support consultant trying to solve incidents within queries often do not have a portal access therefore you need to access it via raw links or you use TA RSRT (Query monitor) in BI backend system to simulate query there. When user issue is linked with we reporting TA RSRT is not enough and most convenient way is to run query/query view/web template from via web browser. In order to obtain URLs it is good to start with TA RTST. In all versions of this TA you can choose a way how query data is displayed: LIST – classic raw ABAP report layout, BEx Analyzer – MS Excel layout and HTML – web reporting layout. In case you opt for HTML and execute some report, you can afterwards get a URL for this report. See post related to "ABAP web reporting URL parameters" as well. There is a pair of SAP transactions which might be used when you need to reset data from SAP database tables temporarily stored in buffers. Actually those codes are not real transactions but so called OK fields that are able to be entered in field of transaction within SAP GUI. It is been a while a rumor is spreading over web regarding SAP is willing into Teradata acquisition. SAP would strengthen it data warehousing products portfolio where have a big share others pure data warehousing companies like SAS. Over last year’s acquisition war with IBM, when SAP got Business Objects and IBM got Cognos it seems that that it strikes back. Teradata is currently very proud to be independed as its spin off from NCR Corp in October 2007. Of course they would to stay as they are – independed. On other hand SAP has recently announced big freeze that would possibly mean share holder of SAP do not want to spend any additional money in today’s financials crisis but they can be on opposite side as the current markets very low rates and it might worth to invest in acquisition. Teradata is well known for its massively parallel processing system. It has its own database system (DBMS). It is very fast and very suitable for very large size of databases. Formerly they had a hardware portfolio of products as well. Still they offering they brand of disk arrays. They invited so called AMP Access Module Processor – a common discrete chunks distributed evenly among the database in order to read it very fast. Before AMP was hardware; now it is a software component. Let see what future will bring and how data warehousing companies compete between each other, how ORACLE, SAP, IBM, TERADATA, SAS, SYBASE etc. It is been one and half a year since I wrote this post and things are getting closer. Recently (around end of April) SAP and Teradata announced agreement to provide SAP NetWeaver BW+ on the Teradata environment (database). In terms of this integration SAP BI portfolio including BW and BusinessObjects software will be co operable with Teradata Active Enterprise Data Warehouse solutions. SAP BW will be running natively on Teradata database platform. By this agreement we can assume that SAP’s intent to acquire Teradata is over or it is just another step to get into it. See here on what else SAP is cooperating with Teradata. Query Monitor is very useful tool used to analyzing problems with BI queries. You can very quickly find out how healthy your queries are and so on. Tool is accessible with transaction RSRT but there are 2 more transactions: RSRT1 and RSRT2. Difference between RSRT and RSRT1 is that via RSRT1 you can run Query views as well. What differentiate RSRT2 against two others is not clear to me. Somebody got an idea? TA RSRT, RSRT1, RSRT2 difference?